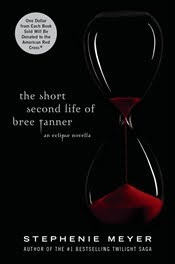 Okay, you Stephenie Meyer fans: Publisher's Weekly announced this morning that Stephenie Meyer will be publishing a novella titled The Short Second Life of Bree Tanner . Bree Tanner is, if you remember, a minor character in Eclipse . The novella will hit shelves on June 5th, and part of the proceeds will be donated to the American Red Cross. In addition, the novella will also be available for free online from June 7th to July 5th. You can go to the official website at breetanner.com! So, what do you think? Are you excited? Not so much? Will you buy it, borrow it, or read it online? Read the PW article here. I think I would read it - mostly out of curiousity. At least this one has a relevant title. cool!!! can't wait to read it!!! I can't even remember who Bree is so I guess that tells you what I think about it. I am glad for the Twilight fans though. I know they'll devour it. I'd read it. If anything, Meyer is super imaginative & her stuff is fun to read. I haven't read beyond Twilight so I don't know. But if I get around finishing the original series, I might check it out. I can't remember that character for the life of me. I'll read it out of morbid curiosity not because I'm a Twihard. I will eventually read it I can't remember BRee either, but she was a minor charactor. Still I like reading inter-related books. I feel like I'm re-visiting a favorite location. Yeah, I have no clue who that character is. I have about a million other books to read, so yeah, my money is not going on this one. I'm not sure, but I think Bree is the character turned vampire in Seattle and used by the "renegade vampires". She is killed by the Volturi at the end of Eclipse. I agree with Bekah - interrelated books, even more than sequels, feel like visiting a favorite place. So yes, I will read this one, but probably just check it out from the library. Which means it will take several months to get to my name on the list. I'll probably buy a copy for my students. Bree is the screeching newborn who the Volturi are less than sympathetic to at the end of the newborn battle in Eclipse. A novella about her life (released just 25 days before Eclipse the movie!) is going to give enormous insight into what Victoria and her ravenous army were up to prior to battle. Is it wrong that I'm a tad bit Team Victoria simply because of how badass she is? Personally I'm hoping that Meyer will have learned from her past mistakes and not butchered this up like she did the Twilight series. Personally I hated Twilight but call me a hypocrite I'm going to read this. Partially out of curiosity to see if it'll be as bad as Twilight or perhaps improved. I loved her other book The Host; maybe this book will lean more towards that in terms of plot and characters (though when Bella Swan is involved, this hope of mine will probably be crushed to mush) but I'll be reading it to see. Im glad that i read it. I read it right before Eclipse came out. and it kind of gives you an understanding of Bree.